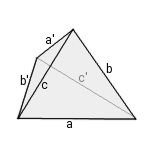 Calculations at a general tetrahedron. A tetrahedron is a polyhedron of four triangular faces. Mostly, the term tetrahedron is used for a regular tetrahedron, but here the general tetrahedron with different side lengths can be calculated. Its faces are the triangles (a, b, c), (a, b', c'), (a', b, c') and (a', b', c). 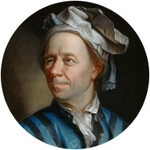 The volume formula of the general tetrahedron was discovered by Leonhard Euler. Enter the six side lengths and choose the number of decimal places. Then click Calculate. In every triangle, any two sides together must be longer than the third side. The lengths have the same unit (e.g. meter), the area has this unit squared (e.g. square meter), the volume has this unit to the power of three (e.g. cubic meter). A/V has this unit -1.